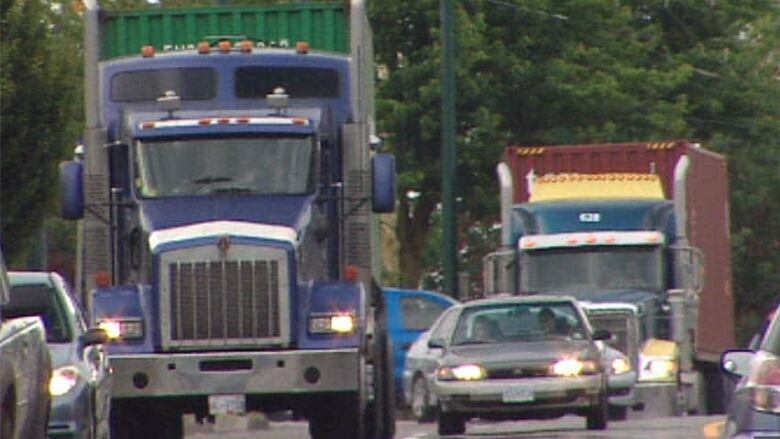 Port Metro Vancouver to deal with an oversupply of trucks that has led to "intense competition" and according to truckers, low rates for drivers. Port Metro Vancouver is finalizing the details of a new licensing system for container trucks serving the port. Port Metro Vancouver has announced a round of consultation to finalize details of a new container truck licensing system in order to deal with an oversupply of trucks serving the port. The issue came to a head in the spring when container truck drivers, who said they could no longer make a living, went on strike, eventually earning a 12 per cent hike in round-trip rates and a minimum hourly rate for drivers. At the time, truckers raised issues of rate undercutting and long wait times. Port Metro Vancouver says the new licensing system will address some of the issues by balancing the number of registered trucks with the amount of available work. "There are too many trucks registered for the work that is required, which has caused intense competition between trucking companies, not enough work for many truckers and reports of the undercutting of agreed rates,” said the port in a news release. Port Metro Vancouver says it reached this conclusion after detailed analysis of GPS data from the 2000 trucks registered to serve the port. The port says it will set new criteria for licensing and everyone will have to re-apply. It says it will also establish a program to ease the transition by assisting owner-operators who do not meet the new system's entry requirements. The new licensing system is expected to be operational by February 2015.